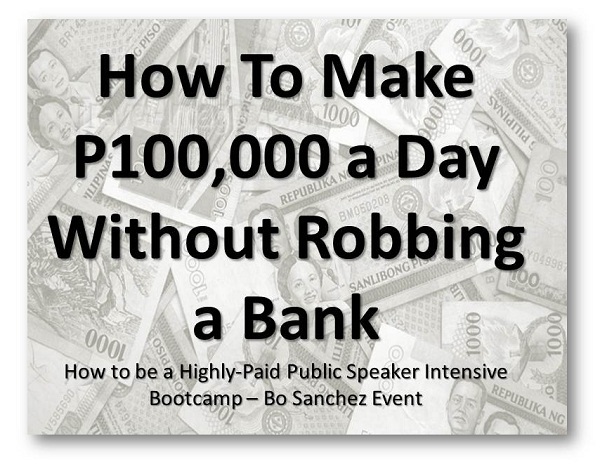 Here's an invitation from my mentor Bo Sanchez about becoming a great speaker. This is about bootcamp invitation from the Truly Rich Club founder. Again this is from Bo Sanchez, the founder of Truly Rich club. Do you want to become a highly paid public speaker? Do you want to be an in-demand corporate speaker and earn by giving training workshops, seminars, and conferences? Or perhaps you’re in sales. Do you want to communicate better so that you can sell more? Hi! My name is Bo Sanchez. If you don’t know me, let me tell you: speaking is MY LIFE. I’ve been speaking for more than 30 years around the world. So far, I’ve spoken in 14 countries including 36 cities in North America. To this day, I still speak 200+ times a year—both in religious and non-religious engagements. When I was in first year high school, my teacher forced me to join an oratorical contest. Because no one wanted to join. And she probably threw darts on the board—and the dart landed on my name—so she picked me. I won second place in that contest. But that’s because there were only two contestants! I bombed so badly, I remember rambling about like I had just had my appendix removed and I was still high on anesthesia. I wanted to die on stage. It was so humiliating. At that point, I was praying that an earthquake split the earth open and swallow me up. Speaking was NOT for me. I was only 13 years old. My family was attending a small prayer group. I went home that night and prepared my talk. It was true that I was still reading Superman Comics and watching Voltes V, but slowly, I was already falling in love with God. I picked up the Bible, closed my eyes, shuffled the pages like a deck of cards, opened the book, and pointed my finger on one page. I read the word I pointed to: “Eternal Life.” So I got my high school pad paper and began writing everything I knew about “Eternal Life”. When I was through, I wrote down 20 pages. I walked in before an applauding group of people. But their excitement didn’t last too long. In other words, it was a major disaster. Once again, I felt so humiliated. I sat down and told myself I will never give another talk in my life again. Never! That reflex answer again… But it’s that answer that has brought me to my great success today. You Can Become a Great Speaker! I told you that wild story to give you one message: You can be a great speaker. I started lousy. I started sleepy. I started lame. But as the years went by, I became better. If a 13-year-old scrawny, high-pitched boy afflicted with severe inferior complex can be an international, in-demand, and highly-paid speaker, you can do it too. One reason why I continued to grow as a speaker? Aida’s belief in me was unflinching. Even when I was the most boring speaker in the universe, Aida smiled all through my talk. She laughed at my jokes when others yawned. She said “Amen!” when others wanted to leave. Because one woman believed in me. Hey, I’d like to be an Aida to you. I believe YOU can be a great speaker. But speaking better is just the first step. I can help you monetize your speaking. For the first 20 years of my speaking career, I always spoke for free—because they were all religious events. For the longest time, I knew that my core gift was speaking—but I never really thought of earning through my speaking. I used it primarily for service. But when I was 30 years old and decided to get married, I wanted to earn money. So I tried my hand on other types of businesses. One after another, I opened up a squidball kiosk in the sidewalk, a hotdog stand in a mall, and a clothes store in a flea market. I also sold engine oil and memorial plans! After a few months, all my businesses went belly up. I couldn’t understand why I kept failing. Was business this impossible? Until it hit me: I was getting into things outside my core gift. It was all unfamiliar territory. Food retail? Engine oil? Memorial plans? What was I doing? The learning curve was simply too steep. I didn’t know much about these areas, it just took too long for me to learn, and while I was learning, I was losing money fast. And I obviously didn’t have passion for what I was doing—or I would have stuck with the business until I succeeded. Finally, I woke up to reality and decided to stick to my core gift: helping people live a more abundant life by my speaking. But as I said, I hit a wall: I’ve always done it for free—speaking in parishes and prayer groups… Could I actually charge for my speaking? Obviously, I wouldn’t charge parish churches and prayer groups. But how about large, profitable companies? I was simply ashamed to ask. Again and again, I’d find myself speaking to these corporate conferences in 5-star hotels where everyone gets paid: the hotel, the lights and sounds, the events coordinator, even the emcee they hired for the day. Except the keynote speaker: Me. All because I didn’t charge. One day, I was invited to speak at a huge company event. Wow. And how much did I get for giving my one-hour talk? Let’s just say it was enough to pay for my gas to go to their event—and buy a sandwich along the way just in case I got hungry. All because I wasn’t asking! So one day, I decided to ask. I wrote down my speaker’s fee on a piece of paper and faxed it out whenever I get invited by companies. Because of this decision to ask, I now get paid—more than enough to share to the various ministries that I run. I’m able to do what I love to do—and earn at the same time. I can teach you how to market yourself to companies in the most effective way. I can also teach you how you SHOULDN’T market yourself. (Yes, there are ineffective ways you need to avoid.) I can teach you how to offer ongoing programs, not just one-shot deals, so that you can have a larger impact on your audience. And for you, ongoing income as well. Remember: You always want long-term customers. It’s always easier to maintain a customer than get a new customer. Once companies invite you, you need to learn how to build on that relationship, so you can listen to their needs and find more ways to serve them. I can also teach you how to price your services and charge correctly. A lot of people make terrible mistakes in this area. Your speaking fee is only one way of earning as a speaker. There are other MORE profitable income streams that you need to build as a speaker. How? Think of other ways you can serve your audience! Will a speech be enough to impact their lives? How about if you give other wisdom material that will help them remember your message after your talk? How about an executive coaching program? eBooks and books? Manuals? Online courses and audio talks? A membership club? Other speakers do this from a purely financial motivation—They just want to earn more. But that’s not my style. Nor should it be yours. I believe that if you serve people in the best way, the money will follow. Automatically. You’ll learn the 3 KEYS that will make you speak on stage with 100 percent total confidence, no matter who you’re talking to, no matter how large the audience. You’ll discover the 5 powerful “attraction” strategies to make your audience “naturally” listen to your message. You’ll identify your own specific style of speaking, using your God-given strengths of personality and gifting. You’ll stopimitating every good speaker you hear and instead stick to your sweet spot and go deep. You’ll learn the ONE very important adjustment you need to make in your presentation style as your audience gets larger. (So many speakers forget to do this—and fail miserably.) Yes, there’s a difference between speaking to 30 people, 300 people, and 3000 people. Get to know “your” best way to prepare for a talk—using your own learning style. Remember: It’s in the “General’s Tent” where wars are won, not in the battlefield. Warning: Powerpoint presentations can be a distraction. It can actually take people’s attention away from your message. Learn how to use it and how NOT to use it. Know when and how you should simply stand on stage and tell your story—without anyPowerpoint slides behind you! Learn the strategies on how to present yourself as an expert. NOTE: People will hire you only if you’re a perceived expert in their minds concerning the field/topic they are looking for. Create a powerful “marketing machine” you need to tell your prospective customers about you. Learn what you should NOT do when you tell the world about your speaking services. How to achieve the biggest income from each speaking engagement. Learn how to sell from the stage with sincerity and conviction, so that you can share your wisdom material (books, eBooks, courses, coaching programs, etc.) to your audience, thus creating another income stream for you, and helping people apply your message to their daily lives. Find how you can create long-term customer relationships with your customers through a “funnel” system. How Much Is the “Successful Speaker System” Worth? Obviously, a 4-day Bootcamp with this massive input (and unique body of wisdom) will not be cheap. The price of the Bootcamp is P79,975 only—which INCLUDES your 4-day/3-night Tagaytay Hotel on twin sharing plus ALL Meals during those entire four days. PLUS the materials you’ll need. 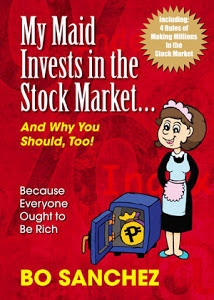 However, you can avail of the Early Bird price of P69,975 only (Savings of P10,000.00) if you register before June 30. This is a HUGE steal for what you’ll be getting from the Bestselling Author Bootcamp. But wait. Here’s an even BETTER NEWS: If you’re one of the next 35 people to register, you get your Bootcamp tickets at a VERY SPECIAL EARLY BIRD PRICE of P54,975 only or Three Monthly Payments of P19,975 ONLY! This is an unbelievable “insane” price that you should take advantage of. I will take all the risk. I don’t want you to pay anything if you won’t be totally satisfied. For any reason whatsoever, IF you didn’t like the Bootcamp (let’s say you didn’t like how my hair was combed on the third day), then just tell me—and I’ll return all your money, no questions asked, no hard feelings. And to apologize for “wasting your time”, I’ll add P5,000 to cover for your transportation to Tagaytay. My staff call this “Insane” but I insisted on this because that’s just who I am. Why am I giving you this “Insane Five Grand” Guarantee? Because I believe you’ll be GREATLY BLESSED by our Public Speakers’ Intensive Bootcamp. I’m giving this visual, auditory, and experiential treat if you sign up for the Bootcamp. One of the best ways of improving your speaking is to expose yourself to the best speakers you can find. As a Huge Bonus for joining our Intensive Bootcamp, you’ll receive a special “10 Best Speakers’ DVD Collection” featuring the most dynamic, most moving, most engaging speakers you can ever listen to. These speakers are all my friends, and they’re the best communicators in the country today. Study their styles. Study how they communicate their message. Study the tools they use to connect with their audience. Note: This DVD collection isn’t sold as a separate product. This Bonus is given for free to students of the Intensive Bootcamp. Before you run out of our Extremely Discounted Early Bird Tickets and this Huge Bonus, sign up now. Share your message to the world, increase your income stream, and join the How to be a Highly-Paid Public Speaker Intensive Bootcamp on August 14 to 17.